Whenever you look at your smile in the mirror, what is the first thing that jumps out at you? If it’s flaws like stains, chips, cracks, or gaps, then you’re far from alone. 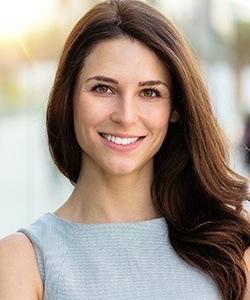 With cosmetic dentistry, we can give you the kind of smile that always fills you with confidence, not doubt, and we’ll likely only need one or two appointments to do it! If you’re ready to get the beautifully bright smile you have always wanted, give us a call today to schedule a consultation in our dental office serving Freetown and Assonet. 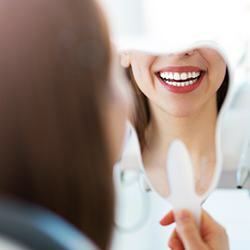 Why Choose Woodside Dental Care for Cosmetic Dentistry? If you’ve ever turned on the TV or watched a movie, you’ve more than likely already seen porcelain veneers. They are extremely thin ceramic restorations, and they can be fitted over the front of the teeth to dramatically improve their appearance. They’re able to fix noticeable stains, chips, cracks, gaps, and even slightly crooked teeth all at the same time, and they’re the secret behind many of Hollywood’s most gorgeous smiles. Veneers are always custom-made based on a patient’s specifications, so you can enhance just one tooth or get a complete set to dramatically transform your smile. 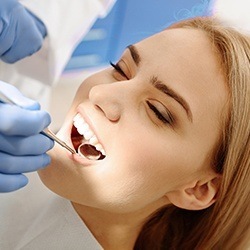 In either case, the procedure generally takes only two appointments. 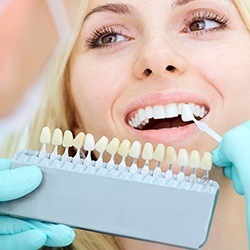 At the first one, we’ll work with you so we can know what you want your final result to look like, and then we’ll take an impression of your teeth. This will be sent to a dental lab to actually fabricate your veneers. You’ll then return to our dental office to have them placed onto your teeth. With proper care, they can easily look like new for more than 20 years! Traditionally, dental restorations were only made of silver or gold, making them less than ideal for repairing teeth that show prominently in the smile. Thankfully, we now have a much more aesthetically-friendly option: metal-free restorations. These crowns and bridges are made of dental porcelain or highly esthetic ceramic and they can be shaped and shaded to perfectly mimic the appearance of real enamel, right down to the finest detail. With them, only you and your dentist will know which tooth isn’t real! Direct bonding is a quick and easy way to take care of minor stains, chips, and flaws. 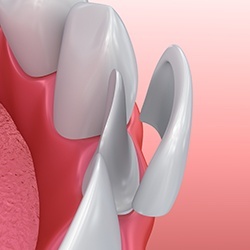 Dr. Cornetta will literally sculpt your problem tooth to perfection using a color-matched composite resin, improving its shape, size, and color while hiding any imperfection along the way. This procedure is offers an immediate fix, no impressions or labs necessary. Want to whiten your teeth in time for an upcoming wedding, date, or job interview? For patients hoping to brighten their smiles fast, our in-office whitening treatment can break up even the most stubborn stains in less than an hour. We’ll simply apply and reapply a powerful whitening solution to your teeth until we reach your desired level of whiteness. Want the flexibility to effectively whiten whenever and wherever you want? We can send you home with your own customized whitening kit, which will have mouth trays custom-made for your smile and a bleaching gel much stronger than anything you can buy in stores or online. You’ll simply need to use our kit as directed for about two weeks to see complete results. Now, you can enhance your smile while relaxing at home, surfing the web, or binging your favorite show. Combine this with in-office whitening for a truly dazzling smile! Would you say that you have a “gummy” smile? Does your gum line overshadow your teeth and cause them to look short, stubby, or uneven? This is a very common issue and one we can take care of in just one appointment using our soft tissue laser. With it, we can quickly and painlessly remove excess gum tissue to unveil previously hidden tooth structure, making the teeth instantly appear longer. We can then reshape the new gum line along the teeth to create that perfectly balanced look. 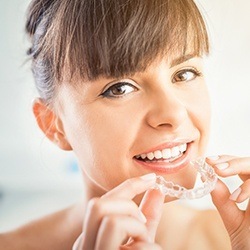 Clear aligners, like ClearCorrect are an orthodontic treatment designed with esthetics in mind. It uses a series of clear plastic aligner trays to gently straighten crooked, crowded, and gapped teeth, and they are so discreet looking that no one will notice you’re using them unless you tell them. The trays are easily removable as well, meaning patients can maintain their normal diet and oral hygiene routine throughout treatment. Better yet, ClearCorrect is often able to work faster than traditional orthodontics as well!